Sponsored Post: A Good Night’s Rest With ZzzQuil!! Have you ever had trouble falling asleep the night before an important event only to watch the precious hours slowly slip away? A good night's sleep is essential in order to be alert and ready for whatever challenges the day may bring. Have you ever wanted to take Nyquil as a sleep aid even though you may not have been sick? Sometimes there are other factors that may impact our ability to sleep such as stress and insomnia. 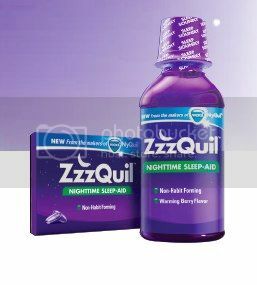 Now from the makers of Vicks Nyquil comes ZzzQuil. It's not for aches, pains or runny noses- it's just for sleep! ZzzQuil's active ingredient, diphenhydramine HCI, helps reduce the time it takes for you to fall asleep, so you can sleep soundly and wake up refreshed. ZzzQuil is the only over the counter sleep aid medication that is available in BOTH a liquid (Warming Berry flavor) and Liquicap form. The Warm Berry flavor tastes great and goes down easy. It helped me go to sleep fast and I didn't feel drowsy the next day. You can't miss it in the medicine isle because the packaging looks very similar to all the other Vicks products you love such as Nyquil. ZzzQuil is safe, non habit forming and delivers the same effective relief consumers have come to expect from Vicks products. ZzzQuil is intended for adults and children aged 12 and older. P&G gave me this ZzzQuil product to sample and I have been monetarily compensated for this post, however, all thoughts and opinions are my own.